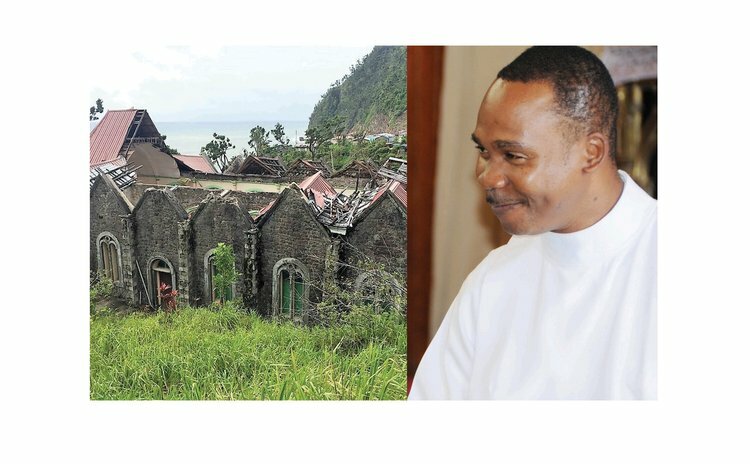 Father Branker John during Hurricane Maria: "I think I am going to die tonight"
Father Branker John, the Grand Bay parish priest, weathered Hurricane Maria at the house of the Grand Bay presbytery located right next to the Catholic Church. He said he was advised against doing that but he "felt that the house was strong enough to withstand the storm". "I was not anticipating hurricane force winds that strong…the walls are pretty thick so it could withstand some wind. "Nonetheless, I had already surveyed the building and decided that there were a few areas that I could hideout in the event that the worse comes to the worst. So, I decided to spend the night there, against the judgment of my parishioners who felt that I should not be there especially by myself. But I was there by myself and I must tell you that it was a very frightening experience. I was there from 7pm when we started feeling the hurricane force winds until 2am. It was non- stop action; remember I am right on the edge of the Atlantic Ocean." Father John continued: "At about 8pm, I felt the house with these thick walls starting to shake and I would hear some of the galvanize sheets being ripped off the roof. I started to panic a bit and said 'oh boy this does not sound good'. Upon hearing the galvanize sheets being ripped off, I started to move from room to room looking for shelter because the house started to leak. Eventually I got downstairs in my office which has a concrete ceiling and the walls are pretty strong. So I arrived there about 8:30pm and spent the rest of the night there in the dark, on a chair…the house was shaking right through. "At one point I said to myself, 'boy that is what it is like to die. I think that I am going to die tonight'. It was that scary. People ask me after, 'Father, were you praying?' I said 'no I was just listening'. I had prayed already in the afternoon and I had already commended Dominica into the hands of the Lord and said 'Lord, I don't know what tomorrow will be like'. In fact I remember standing on the porch at 4pm the Monday afternoon and looking at the Atlantic ocean which looked dark and grim and said Lord, 'I wonder at this time tomorrow what is it going to be like, but whatever it is, I commend it into your hands'. So I had done the praying already. So I just sat there listening and waiting for the house to crash. Thanks be to God, it didn't". He recalled that during the night there was a little lull for a few minutes and so he decided to check out a noise which appeared like water dripping. So he opened one of the doors to see what was going on and felt a strong breeze on his face. "I am saying 'all the windows are closed where is this strong breeze coming from?' So I used my phone to flash and was amazed at what I saw…a big hole in the door, part of the roof gone. Also the exterior door was gone," the priest said. At about 4:30am on the September 19, two men came in search of Fr. John shouting: "Anybody home…anybody home?" He went out and said: "Yes, yes… I am alive." "They then said to me 'Father, there is a big hole in the church'. I went with them, it was still dark and we used phones and flashlights and I could see the sky. I shivered because I didn't expect that because I was banking on going to the church for shelter. Praise God I didn't because I would have died. "We have spent about EC$50,000 so far in the house; we still have moulds but it's live-able. "The church which was built in 1924 is damaged and the engineers say it will cost millions to repair since the walls have no steel and we already had leaks and cracks before Hurricane Maria." Father John remembered Hurricane David; he was five years old. He said the river was raging, the sea cutting off roads. "It was really bad," he said. "In my homily I say to the congregation all the time that we need to pray that we do not get hit again like that. At least, not this year because we are not ready for this kind of storm. So many people still under tarpaulin, roofs leaking, people waiting for materials. My family home in Colihaut still in a bad shape - river went right through it. We still in a bad shape; it's uncomfortable and distressing. "So in the Parish of St. Patrick (Grand Bay) we are going to do what we call Rogation Days… (like the older days, the old people still remember that it will be days of fasting and praying in the last week in May with pilgrimages and all so that the Lord can guide and protect us during this hurricane season."